The biggest advantage of drying fruits in your own dehydrator is that you can monitor the drying process from beginning to the end. This way, you can be sure that there are no added chemicals or preservatives in your dehydrated foods. The dehydrated fruits available in the markets often have plenty of preservatives added to them which are not healthy and often people are allergic to some of the chemicals that are used for preserving dried fruits. So, if you’re looking to dry fruits and make a healthy and nutritious snack in your own house, then read on and choose the dehydrator that suits your budget and requirements. Buying a fruit dehydrator might seem like a simple thing, but there are certain features in dehydrators that can make it easier to dry fruits. Let’s take a quick look at the things you should look for in a fruit dehydrator. Timer and Thermostat - Some fruits dry up at lower temperatures while others need higher temperature to dry them properly. Also, you need to figure out the right amount of time for which to dry the fruits otherwise they’d end up being too chewy or too soft. This is why having a timer and thermostat for choosing the right time and temperature is a necessary feature in a dehydrator. Space Between Trays - A dehydrator should have ample space between trays as having less space means you might need to slice the fruit thinner and this can lead to variation in drying of the fruits. With more space, you can slice the food in as thin or thick pieces as you like. Dishwasher Compatibility - Make sure that the trays are compatible with the dishwasher you have as you will need to wash them often and properly. Drying fruit in a dehydrator means it often leaves a sticky residue that is difficult to clean. By putting the trays in a dishwasher, you can easily cut down on the time needed to wash the trays. Fruit Rollup Trays - You should also check if you can get fruit rollup trays and sheets for making fruit leather or fruit rollup from your choice of fruits. Often, dehydrator models come with their own silicon fruit leather sheets which are of better quality than generic ones that you can buy online. The Chefman Food Dehydrator Machine is built while keeping in mind the needs of consumers that need to dry large amounts of fruits. The unit comes with nine large trays that offer immense drying capacity as each tray measures 13”x12”. The innovative design of the dehydrator ensures the heat stays inside the dehydrator and moves through the trays for efficient drying. With 600 watts of drying power, you will be able to dry your foods just the way you like. 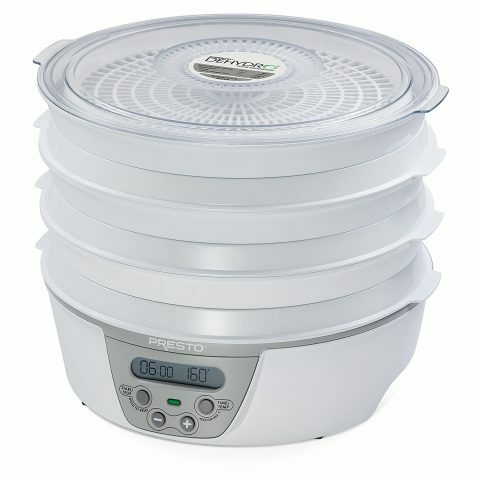 Presto 06301 Dehydro Digital Electric Food Dehydrator offers a range of options and immense drying efficiency. You can loads up all the trays with ease and dry the fruits quickly when you use this dehydrator. With six trays, you will never feel the lack of drying space. Simply add the fruit slices, choose the time and temperature and let the dehydrator work its magic. And when you need more drying space, the six trays can be expanded up to 12 trays! Gourmia is a company known for making solid and reliable dehydrators. 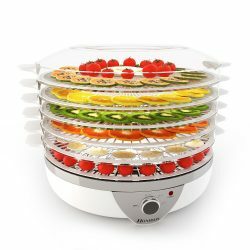 The GFD1950 Digital Food Dehydrator comes with 9 drying trays that offer ample space for drying a large amount of fruits. This dehydrator also has a thermostat and a timer so that you can adjust the time and temperature according to the needs of your recipe. The transparent window allows you to keep an eye on the progress of dehydration. The NutriChef Food Dehydrator is a powerful unit that comes with 250 watts of drying power and five trays that allow enhanced airflow. The unit has a transparent cover so that you can keep track of the progress of the dehydration. It is ideal for drying large quantities of fruits as you can stack the fruit on trays with ease. The unit reaches a maximum temperature of 180 degrees F which is perfect for drying various kinds of fruits, vegetables, meats, and more. The Nesco FD-75A Snackmaster Pro Dehydrator offers 600 watts of drying power and you can also adjust the temperature as needed with the provided thermostat. The unit comes with 5 trays, but you can add up to 12 trays as needed. The dehydrator also has an Opaque Vita-Save exterior that blocks any harmful light that can damage the nutritional value of the dried foods. With the Converga-Flow system of drying, all trays get equal amount of heat. Excalibur dehydrators are known for their high quality and powerful performance. The Excalibur 3926TB Food Dehydrator is one such unit that offers efficient drying with 600 watts of power. The nine trays offer ample space for drying food and you can also change the temperature with the provided thermostat. The 26 hour timer is perfect for long drying sessions. 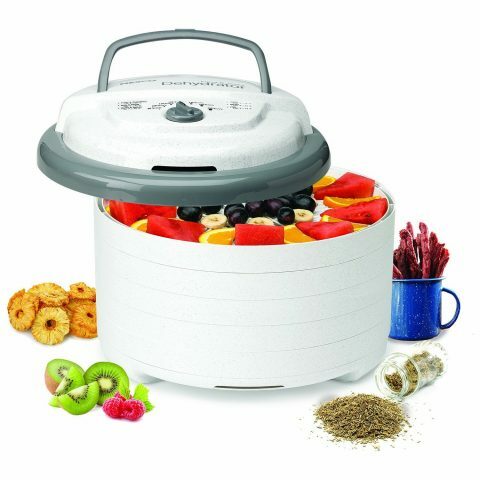 The Hamilton Beach 32100A Food Dehydrator offers everything you can ask from a dehydrator. This unit comes with a 48 hour timer and a 500 watts of drying power. The trays are stackable so they take up less space when you store them. You can also adjust the temperature and time according to the recipe you want to follow. 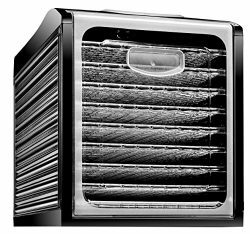 Nesco is the company known for making durable and high powered dehydrators and other home appliances. The Nesco FD-1018A offers 1000 watts of drying power for quickly and efficiently drying all kinds of fruits, vegetables, meats and more. The unit also comes with Converga-Flow drying system that does an efficient job of pushing hot air up through the trays. You can also adjust the temperature with the included thermostat and if you need to dry more food, the dehydrator can be used with up to 30 trays. The Rosewill Countertop Portable Electric Food Fruit Dehydrator is a small but powerful unit that offers everything you need in a dehydrator. 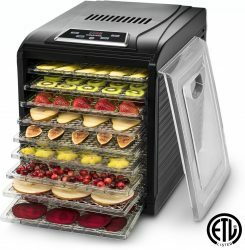 You can dry up to five trays of food in this dehydrator that offers up to 250 watts of drying power. 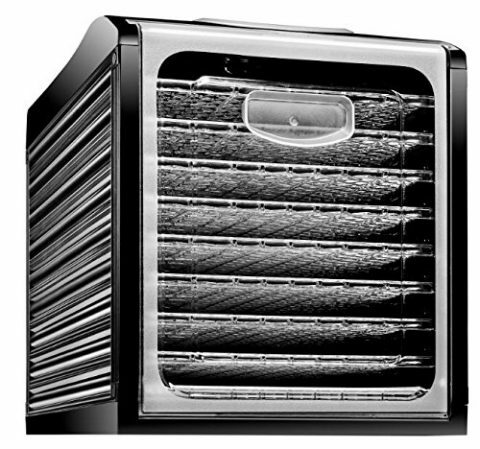 The fan in this unit is mounted at the bottom and it offers uniform drying power by blowing hot air through the trays for an efficient drying experience. The Homdox Food Dehydrator Machine is the ideal dehydrator for drying all kinds of fruits, meats, vegetables or nuts. The unit comes with five trays and the heating element is mounted at the bottom. The trays are completely dishwasher safe and the whole unit is also very easy to clean. With 500 watts of drying power, you will be able to dry fruits quickly and easily. Buyers often have questions about how to use the fruit dehydrators or how to make use of certain features in the best way possible. 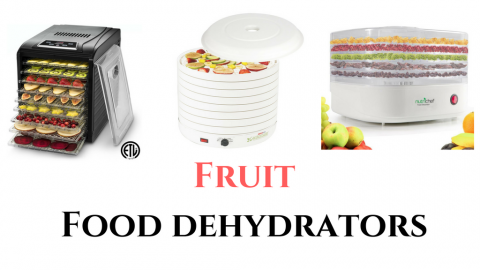 Here are some of the frequently asked questions about fruit dehydrators. 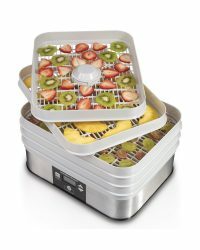 Q1) I dried some fruit in my new dehydrator and now all the trays have a sticky residue on them. How can I clean these trays? Ans. You can soak the trays in a warm, soapy water overnight and then scrub off the residue with a small brush. Q2) How can I reduce the drying time for apples? My dehydrator takes too long to dry apples. Ans. Drying times depend on various factors such as outside temperature, humidity, and more. You can try slicing the apples thinner for drying them quickly. Also, avoid opening the door of the dehydrator while it’s drying fruit as it lets out all the heat and takes a long time to get heat levels back up. 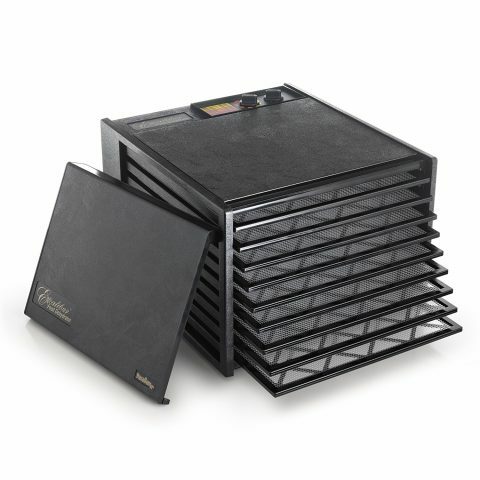 Q3) I want to make fruit leather, but I can’t find silicon sheets that are in size of the trays of my dehydrator. What are my options? Ans. You can easily find liner sheets from online stores or your local grocery store and then you can cut these sheets in the size you prefer for making fruit leather. Q4) Do I need to rotate the trays while drying fruits? Ans. 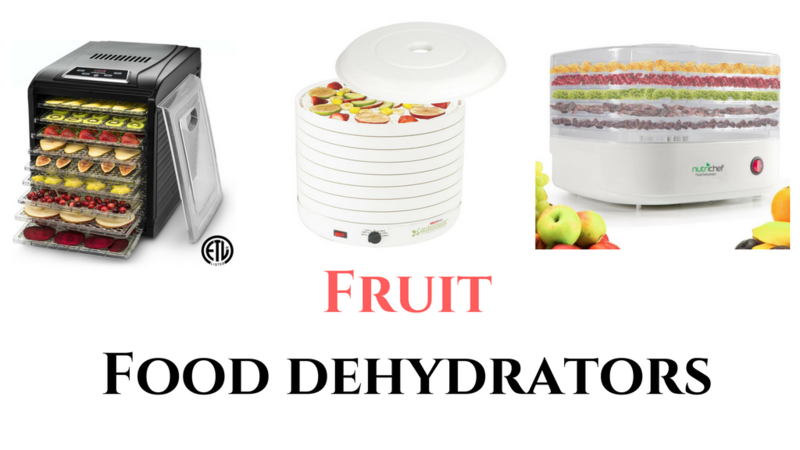 It depends on the type of dehydrator you are using and the type of fruits you are drying. You can dry a few samples initially and if the fruits on different trays have different levels of dryness, you can consider rotating trays once the first cycle of dehydration is complete. Q5) What temperature should I use for drying fruits? And. Different temperatures and times are needed for drying different kinds of fruits. 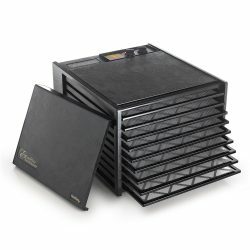 You can consider the manual of your dehydrator for more information drying times specific to your model of dehydrator. 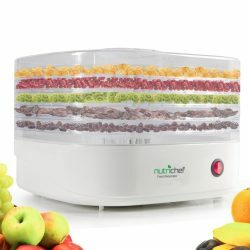 Buying a fruit dehydrator is one of the best decisions you can make if you’re fond of enjoying dried fruit as a snack. Store-bought fruit often has a lot of sugar and preservatives, but when you dry your own fruits at home, you can rest assured about their quality. 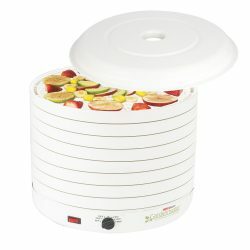 You can dry large batches of fruit in your dehydrator and you can also make fruit rollups and fruit leather depending on your taste. 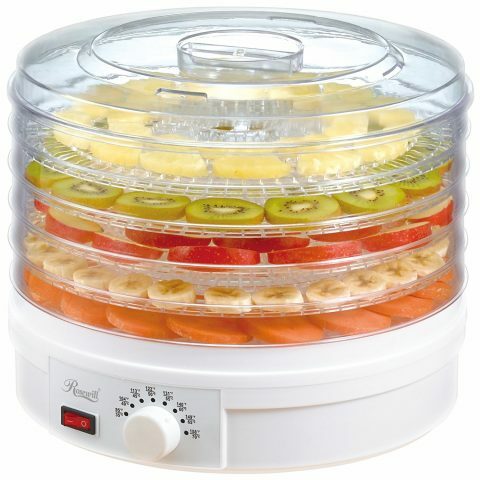 If you have surplus fruit in your house then a dehydrator is simply a must for you. You can make large batches of dried fruit and store it for later consumption as well. We hope this article was helpful in letting you make a decision about which dehydrator to buy!